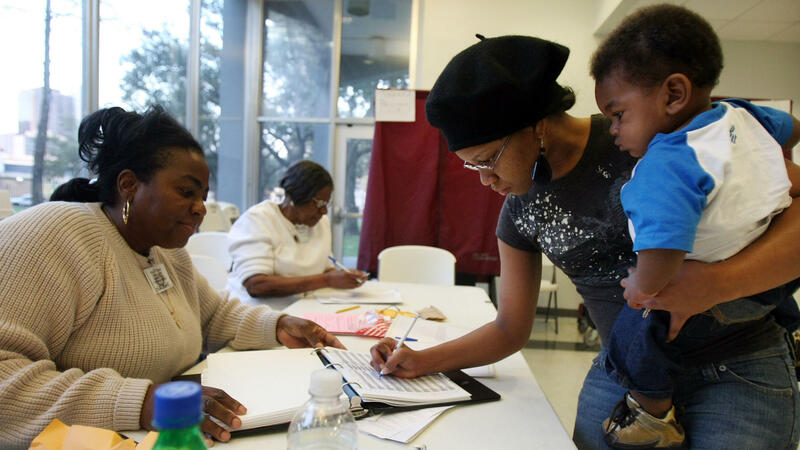 Charnisha Thomas signs in during the Louisiana presidential primary in 2008. In a new poll released Monday, African-American voters say they wait in longer lines and travel farther to get to polling places than white voters. Race, gender and partisan identity are all a factor for those who question the cornerstone of the democratic system. Nonwhite voters, women and Democrats all report substantially greater doubts about the fairness of elections compared to Republicans, 91 percent of whom believe elections are fair. Overall, 47 percent of all poll respondents said they think it is either likely or very likely that not all votes will actually be counted in November. And that was driven by the almost 60 percent of non-white voters who think there will incorrect tabulation. "On a whole this is a pretty lousy report card on the state of American elections," said Dr. Lee Miringoff, director of the Marist College Institute for Public Opinion, which conducted the poll. On the general question about how much people trust elections in the U.S. to be fair, 47 percent of women said they had little or no trust, compared to less than a third of men who said the same. Only 9 percent of Republicans answered that way, compared with 48 percent of Democrats. Natalie Adona, a senior research associate at the Democracy Fund who studies election data, said that may have something to do with the fact that Republicans currently control Congress and the White House, as people generally have more faith in the electoral process if they have been successful in winning recent elections. President Trump was elected in 2016 with a majority of electoral college votes, but he lost the popular vote in the U.S. by almost 3 million votes. That could also be having a disillusioning effect on Democrats when it comes to the "fairness" of American elections. The experience of nonwhite voters, who also report standing in line longer and traveling farther to polling places than white voters, stands out. Forty-six percent percent of those who identified as nonwhite said elections were unfair, compared to 54 percent who said they were fair. Just 33 percent of white voters thought elections were unfair. "There is a gap between white and nonwhite attitudes about a number of aspects of elections," Adona said. "It's not surprising to me, especially folks who come from communities that have faced barriers to voting, that they would perceive elections a bit differently than most Americans do." Whereas 62 percent of white respondents said they travel less than 10 minutes to get to their polling place on average, just 41 percent of African-Americans and Latino voters said the same. The average wait time in line was almost double (15.5 minutes) for Latino voters than for that of white voters (8.6 minutes). Poll respondent LaDonna Bonner, a 47-year-old African-American woman in California said she didn't think elections were obviously biased against people of color in the U.S., but that subtle things like transportation and taking a day off from work are often more difficult than for white voters. "Like, if it takes a day off from work to vote — will I have a job when I get back?" she said. "Those kind of issues may prevent people from voting. But the actual process of voting, I don't think anyone can really tell 'oh this is white person's ballot' or 'this is a black person's ballot.'" In the poll results however, there was clear concern, driven by nonwhite voters, that vote tallying would be inaccurate in November. While speaking with NPR, Bonner went on to mention Robert Mueller's ongoing Russia probe as something that makes her uncertain all votes are going to be counted accurately in this year's midterms. That is despite there being no evidence Russian interference had any effect on vote tallies in 2016 or any year prior. Local election officials are responsible for clearly communicating how votes get counted and whether the results are audited after the election, said Neal Kelley, the registrar of voters for Orange County, Calif. Many voters simply don't know the mechanics of elections, and Kelley compared that to people getting on an airplane. "They don't have an understanding of how that aircraft works, they just want it to get them from point A to point B safely," he said. "By and large people do not have an understanding of the complexity of elections and how much work goes into securing those elections." On a whole, the majority of Americans are satisfied with the job done by American federal agencies to prepare and secure elections leading up to the 2018 midterms, but not in President Trump's efforts. The poll was notably conducted prior to Trump signing an executive order that would impose sanctions on any foreign person or country that attempts to interfere in U.S. elections. More than half of American adults, 54 percent, say the FBI has done a great deal or a good amount to secure elections, and 50 percent say the same for the Department of Homeland Security. Less than 40 percent of Americans say the same for the president however, which tracks almost identically with his approval rating. A new poll from NPR News and Marist College asked Americans what they think of this country's democracy, and here's one thing respondents said. Almost 40 percent of Americans do not think elections in this country are fair. Miles Parks covers voting for NPR, and he's in our studios. Good morning. INSKEEP: What do people find unfair? PARKS: So it's really interesting how divided this poll is when you look at any measurable demographic. The people who are finding the election system most unfair - you've got three key demographics. You've got nonwhite voters, you've got women, and you've got Democrats. Forty-six percent of nonwhite voters, 47 percent of women and 48 percent of Democrats think elections in this country are not fair. PARKS: We know that when you look at a poll like this, when you talk about voter confidence, that a lot of these numbers are painted by the most recent election and the results that we find there. You do see - in the Republican electorate, you see 91 percent of Republicans think elections are fair. INSKEEP: ...Republicans are concerned, as their party has been for years, about voter fraud, the idea that extra people are voting illegally. Democrats, you said voter suppression, which is what? That's preventing people from voting? PARKS: It - preventing people from voting, whether that's by gerrymandering or whether that's by people actually at polling places asking people not to vote. It's kind of a wide bucket, and a lot of these things kind of fit in there. INSKEEP: And how many people or what kinds of people expressed concern about Russian interference in American elections? PARKS: It's - definitely skews a lot more Democrat. You also have nonwhite voters a lot more concerned about that sort of thing than white voters. INSKEEP: Most people did find the election system fair on the whole, right? PARKS: That's definitely true. Though, again, it goes back to partisanship. When we talk about elections, the thing election officials want to do is make this a process of government. Just like a lot of other aspects of government, you want it to be successful for all of the people living in society. INSKEEP: You want everybody to accept the results even if their side lost, sure. PARKS: Exactly. So when you look at 91 percent of Republicans are satisfied, but then this huge chunk of the Democratic Party is not satisfied - and we're not talking about not satisfied with how the elections turned out. We're talking about something about this election isn't right. This isn't representative of what the people want is what they're saying, essentially, which is obviously really worrisome for the legitimacy of government. INSKEEP: Although we should mention we are in a situation which, because of the electoral vote, because of redistricting in the House, because of the way senators are elected, you do have effectively a minority government. A minority of people elected the president, for example. But that's not exactly what Democrats are concerned about. They're concerned about people being prevented from voting at all. PARKS: And specifically at the national level. What's really interesting here is you don't see this concern seeping into confidence numbers in local officials, who are actually the people running the government. A lot of it is focused on President Trump. His numbers for satisfaction with how he's dealing with secure elections track almost identically with his numbers for his approval ratings in this poll. INSKEEP: So not so great. Miles, thanks very much. Appreciate it. INSKEEP: That's NPR's Miles Parks. Transcript provided by NPR, Copyright NPR.